With early spring daring to peer through the grey days it put me in a rather optimistic culinary mood – memories of warm summer days came flooding back. A trip to Davies Fishmongers in Bakers Arms, Walthamstow this week resulted in a large bag of fresh clams… and this made me think of the delicious Portuguese clam and chorizo petisco we had in Lisbon recently. So here is my take on recreating those flavours (and happy summer lazy days): Clam, chorizo & white bean Portuguese stew. Fry the chopped cooking chorizo in large heavy based pan over a low heat until it starts to release its oil. Add the chopped onion to the pan and cook for 4-5 minutes, then add the crushed garlic, chilli, fennel seeds and coriander and fry for another couple of minutes. Pour in the stock, tomatoes and sherry vinegar and bring to the boil, then reduce the heat, add the beans and simmer for a few minutes to let the sauce thicken. Meanwhile wash and pick through the clams, discarding any that are broken or open. 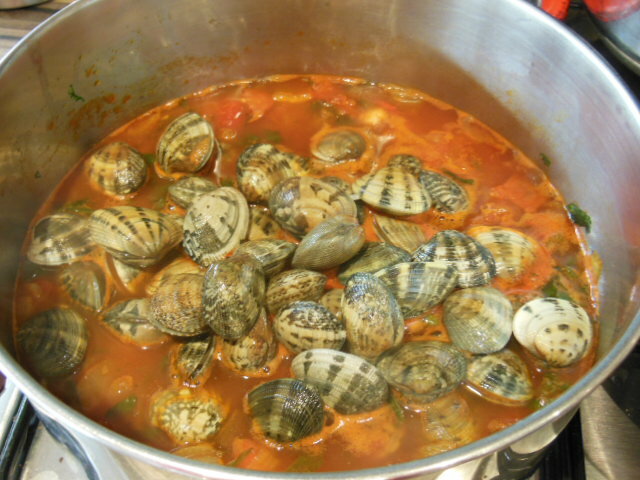 Scatter the clams over the tomatoes, cover with a lid and steam for 3-5 minutes. Shake the pan occasionally until the clams open. Check the sauce, if needed add salt and pepper and a squeeze of lemon juice to taste. Serve with rice, crusty bread or a fresh salad with sherry vinaigrette dressing. 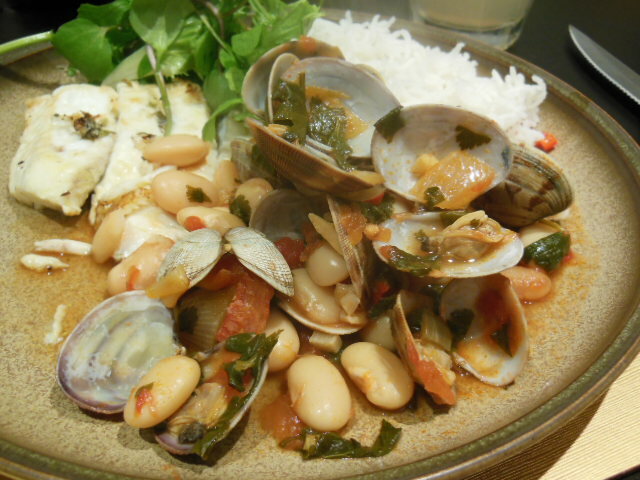 This entry was posted in Recipes and tagged butter beans, chorizo, clam & chorizo, Clams, Portuguese stew. Bookmark the permalink.